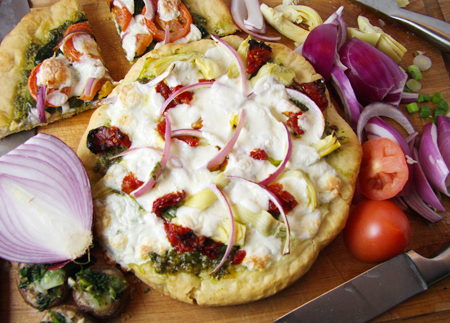 Pesto pizza — Pip and Ebby - easy, delicious recipes! So simple, yet so supremely delicious! Last weekend my bff Heather traveled four hours to Minneapolis for a two-day visit. Oh how I love spending time with her. She is a girl's dream for a friend. She is fun, witty and adventurous. She loves to cook and drink wine with me. She is a great listener and a supremely supportive friend. I love this girl! Whenever we spend time together, we try to squeeeeeeze as many activities in as possible because there is always so much we want to do. So, last weekend, our Friday night plan was to whip up some pesto pizzas and then head to a local Mexican restaurant for a margarita. We accomplished both goals! Wooo! Why pesto instead of pizza sauce? Well, because Heather and I both adore pesto and because I am constantly looking for new foods to combine with its scrumptious green-ness. Heather prepared the crusts and I made the pesto (this time with walnuts!). We compiled our ingredients and started having pesto pizza fun. We loved creating all of the different combinations. By the time we headed out for our margarita adventure, we were pleasantly stuffed! This post is merely meant to generate ideas. Nothing is set in stone. Grab a few different types of cheese, veggies, meat, sauces, whatever you wish, and throw them onto a pizza crust. We baked ours in a 350-degree oven for about 15 minutes. This was our first attempt. 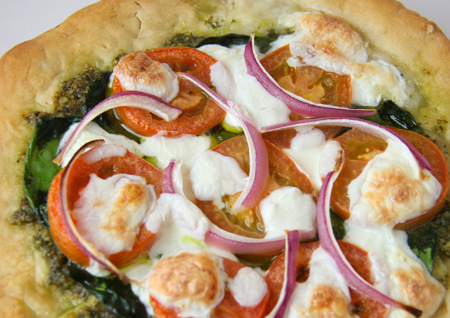 Pesto, fresh spinach, Roma tomato slices, sliced red onions and fresh mozzarella cheese. This creation is one that my husband stayed far away from because it held mushrooms atop its splendor. Pesto, mushrooms, Roma tomatoes, fresh Mozzarella cheese and sliced green onions. This had to be my favorite creation. Of course, anything with sun-dried tomatoes and artichokes makes me weak in the knees. Pesto, fresh spinach, artichoke hearts, sun-dried tomatoes, red onion slices and fresh mozzarella. And I sure didn't complain about this one, either. 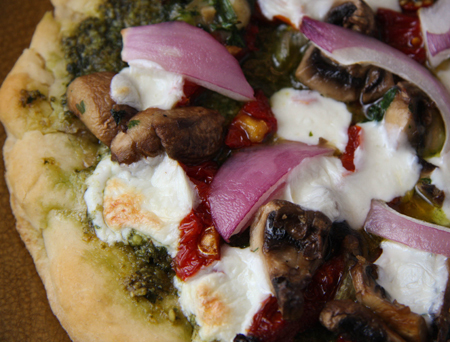 Pesto, mushrooms, sun-dried tomatoes, red onions and fresh mozzarella cheese. Ok, we could have branched out much more, but these were all the ingredients we had at the time. The options really are endless! Our little pizza night has inspired me to do some more experimenting. Maybe I'll head Heather's way one of these weekends with pesto and pizza toppings in hand. 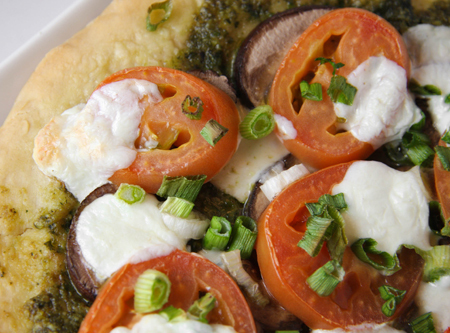 Spread Pesto over your pre-baked pizza crust of your choice. Cover with mushrooms, tomatoes, onions and fresh mozarella. Bake for 15 minutes and serve!